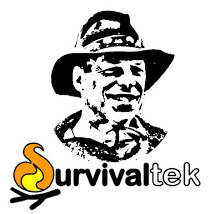 A number of years ago I was shopping at a grocery store and while passing through the BBQ section I saw something interesting… fire starters that would light like a match! They were produced by the makers of Diamond Matches and are made of sawdust and wax with a strikable match head. It was intended for use in grills, campfires, and fireplaces. Each box comes with 8 starter sticks that measure roughly 1/4″x 1 1/4″x 5 3/4″ that can be struck on the back side of their box to ignite. They burn for about 12 minutes each. I thought that this would be a good tool to carry in the emergency kit in my car and it sat there for several years. Recently I wondered if the sticks could be used to cook with or at least used to boil water in an emergency. I had kept the package in a sealable plastic bag however I believe the years of summer heat and the humid climate have effected it as evidenced by the box that seemed slightly saturated with the parafin base and when I struck the tip on the back of the package it would not light. I decided to boil some water in my stainless steel Sierra cup and filled it with water. I placed it on a BBQ bracket to use as a trivit which allowed the fire starter to be placed underneath. I lit the Strike-A-Fire with a lighter and watched the ensuing flame as it slowly spread along it’s length. It took about 5 minutes to bring the water to a simmer… too hot to drink right away. 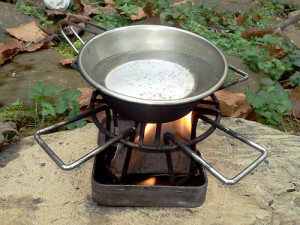 I withdrew the cup, then the bracket, then placed a can briefly over the fire starter. It was hard to completely extinguish as small embers kept smoldering. I placed the remains in a used Altoid tin and it finally went out. That gave me the idea that a Strike-A-Fire stick could be cut in half lengthwise to store inside a tin. When needed the tin could be opened and used as a hearth upon which the stick could be lit. So, round 2 was successful with tinder to spare. In the end, I have to acknowledge that the Strike-A-Fire fire starters were not intended to be used the way that I tested it but it’s nice to know that they can be used that way in an emergency situation. The striking portion does not last indefinitely but the stick portion works fine once lit. It does have a sooty flame so it puts carbon on the bottom of the cooking vessel but I took it down to the nearby creek and rubbed it in the sand which cleaned it nicely. 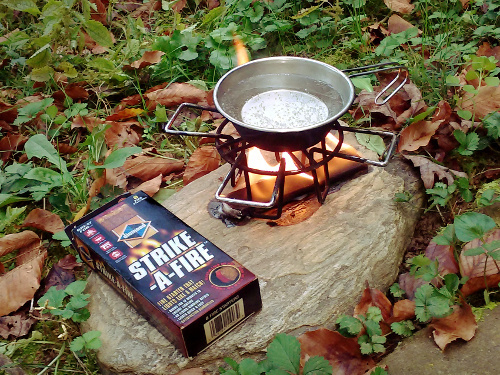 There are other clean burning fuels available that I prefer to cook with but by trying this proof-of-concept I am happy to have learned the Strike-A-Fire’s capabilities and I put them back into my car’s emergency kit for the future. This entry was tagged Boil, Campfire, Cook, Match, Strike-A-Fire, Tinder. Bookmark the permalink.